The modern orchestral maestro Craig Armstrong is revered in both classical and popular music circles. He is equally at home with film scores, arrangements and electronica. His score for Romeo & Juliet earned him the BAFTA for Achievement in Film Music and a prestigious Ivor Novello. A further collaboration with Baz Luhrmann on the musical Moulin Rouge! gained him the 2001 American Film Institute's composer of the year, also a Golden Globe for Best Original Score and another BAFTA. Maybe the pinnacle is his Grammy Award in 2004 for Best Original Score for the acclaimed Taylor Hackford biopic Ray, about the life of the incomparable R&B legend Ray Charles. His feature film credits are many and varied and include The Incredible Hulk, Love Actually, World Trade Centre and the historical drama Elizabeth: The Golden Age and recently The Great Gatsby. Still only 54, Armstrong has an OBE but his music is his calling card. Born in Glasgow in 1959 Armstrong studied musical composition, score and violin (with tutors/mentors including minimalist pioneer Cornelius Cardew, Malcolm MacDonald and Paul Patterson. From 1977 - 1981 he attended the Royal Academy of Music and studied piano. Scholarships and prizes followed, and to accentuate the fact Armstrong is as versatile as they come he even won the GLAA Young Jazz Musician of the Year in 1982. After a spell at the Strathclyde Regional Council in 1984, Craig was commissioned by the Royal Shakespeare Company to write music for The Tempest and The Broken Hearted. Famously quoted for his belief that trip-hop or Bach can be equally appealing and emotionally fulfilling, Armstrong struck up a relationship with Bristol's Massive Attack, collaborating on their epic album Protection. In tribute to him the Massive Attack men initiated their own Melankolic label to release Craig's opening brace of solo albums. Never content to stay still Armstrong has released his own classical albums, written violin concerti, and collaborated with an extraordinary range of fellow artist, eager to absorb his expertise. These include U2 (Bono is a huge fan) Madonna and Luciano Pavarotti. In 2007 his first opera 5:15 - Opera's Made in Scotland was composed with the novelist and fellow-Scot Ian Rankin providing a libretto. Allow us to point you towards a select choice of fine Armstrong music. His first album for Melankolic is The Space Between Us (1988) one of those discs that should be on everyone's essential list. It's a masterpiece. Ever eager and rightly so to push Scottish artist to the forefront when relevant, this set includes marvelous contributions from Elizabeth Fraser of The Cocteau Twins on the ethereal 'This Love' and The Blue Nile's acclaimed vocalist and songwriter Paul Buchanan on the club anthem 'Let's Go Out To Tonight'. The Space… opens with 'Weather Storm', smartly reworked from the original version that appears on Massive Attack's album Protection. Craig also revisits 'Sly' from that disc, radically altering it however so that the revised title of 'Sly 11' is both witty and apposite. Never one to shy clear of using concrete terminology there is also the romantic 'Balcony Scene', that takes its template from 'Time Stands Still' (co-penned with Nellee Hooper, incidentally) and his work on the Romeo & Juliet soundtrack. Armstrong's mix and match approach to sampling allows him to get away with a humorous sample of Des'ree's 'Kissing You' and some choice movie dialogue. He does it, well, because he can. It goes without saying that the production is state of the art and sounds even better today in remastered format. Other goodies to hunt down are an inspired tram up with Marcus de Vries on 'After the Storm' and the deeply felt autobiographical pieces 'My Father', 'Glasgow' and 'Childhood'. By this time you should be growing aware that this music means an awful lot to Armstrong: conceptually astute and enormously rewarding, by the time you arrive at the closing 'Hymn' you should be a convert. No hesitation here, if you missed this first time around, do yourself a favour and rectify that oversight. 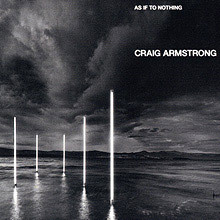 Craig's second independent release As If to Nothing was released in 2002 and won great acclaim although it is ripe for rediscovery today. After the cinematic brush strokes of his album The Space Between Us showed Armstrong fully immersed and au fait with the film score genre. His successes with Massive Attack included advertisements and movie placements and his star was in the ascendant. The guests include Bono, Evan Dando from the Lemonheads, Mogwai, Photek, the British soul singer David McAlmont and stellar names from great dance acts like Big Dish, Alpha and Laub. With his strings and zing well up front the vocalists are used as instruments but Evan Dando is on top form in the electronic hubbub of 'Wake up in New York' and Big Dish vocalist Steve Lindsay enriches 'Let It Be Love'. There are plenty more pleasures here too like the soaring 'Miracle' where fellow Glaswegians Mogwai provide their epic accompaniment alongside the divine Indian singer Swati Natekar. That isn't the last inspired coupling. Alpha's Wendy Stubbs rises to the mark for the atmospheric 'Sea Song', may be the key melody here, Bono gets into character on 'Stay (Faraway, So Close)' and Laub's Atye Greie-Fuchs applies ambient shades of subtle techno spoken word tenets to the bubbling 'Waltz'. Just to remind one that this is still Armstrong's baby, the strings on the title track, the radical beats of 'Inhaler' and the disc opener and closer cuts 'Ruthless Gravity' and 'Choral Ending' (a deliberately matter of fact with a sledgehammer title for a delightful finale) simply make you want to hear more and more of the man's works. If the lush, sweeping strings and ambient beats of The Space Between Us seemed cinematic, As if to Nothing suggests an even bolder turn toward film score territory. It's an indication of how Armstrong's stock rose after Moulin Rouge was released and after his work with Massive Attack was featured in advertisements and soundtracks around the world that so many collaborators join the fray here. Bono, Evan Dando, Mogwai, Photek, and David McAlmont all attempt star turns, and less well-known performers from Big Dish, Alpha, and Laub get in on the festivities as well. But Armstrong's string arrangements are still the focal point, to the extent that most of the collaborators are relegated to a back seat. The album's high points mostly reside in the instrumentals, though Evan Dando's vocals break through the electronic wash in "Wake up in New York" and former Big Dish member Steven Lindsay's voice shines through on "Let It Be Love." Swati Natekar and Mogwai give a strong showing with "Miracle" and Alpha vocalist Wendy Stubbs' tenderly voiced "Sea Song" is sublime, though less studio polish would have aided both songs. The showy reworking of U2's "Stay (Faraway, So Close!)" gives Bono the chance to emote like few contemporary U2 songs. The brilliant "Waltz" sees Laub's Antye Greie-Fuchs presenting a spoken-word manifesto over ambient gurgling. The instrumental "Inhaler" is a punishing change of pace, though it betrays a heavy Depeche Mode influence. 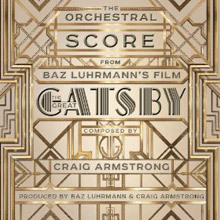 Craig Armstrong’s orchestral score for the Baz Luhrmann film The Great Gatsby which was released in 2013. Craig has collaborated on many scores with Baz Luhrmann, in particular Romeo and Juliet and Moulin Rouge – he actually calls Craig ‘the invisible maestro’ as he brings so much musical colour to the visual images of his films. On the soundtrack Craig captures the very essence of the movie with songs featuring Lana Del Rey and portrays the Gatsby world completely with romance, drama and decadence. Since it was only two years earlier in 2005 that HBO covered the same material in a two-part, three-and-a-half-hour mini-series called Elizabeth I, starring Helen Mirren and Jeremy Irons, and there have been earlier depictions as well, one may wonder why the world needed yet another movie about the 16th century queen of England in 2007. 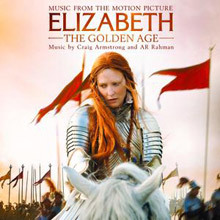 But director Shekhar Kapur could make prior claim to the story in the sense that Elizabeth: The Golden Age was really a sequel, nine years on, to his 1998 film Elizabeth, also starring Cate Blanchett and Geoffrey Rush, and treating the famed monarch's early years. Elizabeth: The Golden Age moved on to the familiar events of the 1580s, well into Elizabeth's long reign, including the execution of Mary Queen of Scots and the defeat of the Spanish Armada. To handle the scoring, Kapur turned to two composers, Craig Armstrong and A.R. Rahman, who are co-credited on all the compositions. Their writing, for an orchestra with bits of "programming" (the percussion sounds augmented by synthesized effects here and there), seems well shaped to the story, providing stately, majestic themes like "Immensities" before turning to an ominous, foreboding cue with choir for the inevitable "Mary's Beheading" and drum rolls and rollicking rhythms for "Battle." At odd moments, for instance in the vocal solo in "Mary's Beheading" and in a sitar-like sound in "Divinity Theme," there is a seemingly inappropriate Indian flavor to the music. Such sounds recall similar elements in another adaptation of a thoroughly English story, Mira Nair's 2004 film of Vanity Fair, and one can't help wondering if the Indian or Indian-heritage artists making these films and these scores felt compelled to sneak a bit of their own culture in, whether it makes sense or not, perhaps as a claim on the Indian influence on the British Empire. 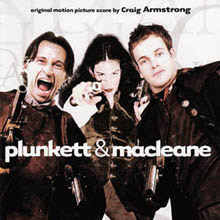 The score for the feature film starring Liv Tyler and Robert Carlyle, Plunkett &amp; Macleane alternates somber orchestral passages reminiscent of Gorecki's Third, the modern classical standby, with a few electronically enhanced moments more in league with Armstrong's compatriots in Massive Attack and Alpha. 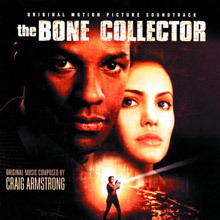 Craig Armstrong's score for The Bone Collector adds to the film's dark, tense story of a bed-bound forensics detective (Denzel Washington) and a policewoman (Angelina Jolie) who must work together to stop a series of grisly murders.